JobBoard.io is a software service that allows recruitment firms to manage employees and job candidates with ease. The feature set in this software has flexible tools that can increase productivity for both your firm and your employees. JobBoard.io is generic in nature, with several reporting and analytics tools that let you track candidates. Hence, you can refer the best talent to your employers every time. Having been in the business for several years, JobBoard.io has captured a wide market of loyal users. Since it is present in many different countries of the world, many renowned international brands have been using this software service for their hiring process. 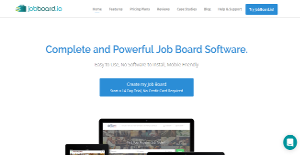 Job board management becomes a breeze with JobBoard.io. The Admin panel gives you a complete overview of your job board activities. The intuitive interface presents all the information regarding job applications, purchases and listings. The settings are completely customizable so that you can mold the functionalities according to your business needs. From a single user ID, you can now manage multiple job boards. HR officers would particularly like this feature because it’s a big time saver. Thanks to a simple application process, your subscribers can apply for jobs in no time. You can track your client’s job progress as well to ensure high quality services. With JobBoard.io, your chances of attracting the best talent for the job increase dramatically, this is because of the SEO friendly blogging and content generation features. Smart analytics tools allow you to design the most search content so that you always appear on top on search result pages. To keep the employer information up to date, there is an employer database also available in the package. They can self-update profiles and manage job postings as well. Managing job postings and stats becomes seamless and gives more room to the employers with their decision making. In addition to that, you can also create candidate database and make additional money by granting access to the employers. If you are interested in JobBoard.io it could also be beneficial to investigate other subcategories of Best Applicant Tracking Software collected in our base of B2B software reviews. It is crucial to keep in mind that hardly any app in the Applicant Tracking Software category is a perfect solution that can fulfill all the needs of all business types, sizes and industries. It may be a good idea to read a few JobBoard.io reviews first as some services may dominate just in a very narrow group of applications or be prepared with a very specific industry in mind. Others may operate with an idea of being easy and intuitive and as a result lack advanced functions welcomed by more experienced users. You can also come across apps that focus on a broad group of customers and provide a complex feature toolbox, but this usually comes at a more expensive price of such a software. Be certain that you're aware of your needs so that you select a solution that provides exactly the elements you look for. How Much Does JobBoard.io Cost? We realize that when you make a decision to buy HR Software it’s important not only to see how experts evaluate it in their reviews, but also to find out if the real people and companies that buy it are actually satisfied with the product. That’s why we’ve created our behavior-based Customer Satisfaction Algorithm™ that gathers customer reviews, comments and JobBoard.io reviews across a wide range of social media sites. The data is then presented in an easy to digest form showing how many people had positive and negative experience with JobBoard.io. With that information at hand you should be equipped to make an informed buying decision that you won’t regret. What are JobBoard.io pricing details? What integrations are available for JobBoard.io? If you need more information about JobBoard.io or you simply have a question let us know what you need and we’ll forward your request directly to the vendor.